This gorgeous cream/oxblood micro package delivers 6W of great stereo tone. 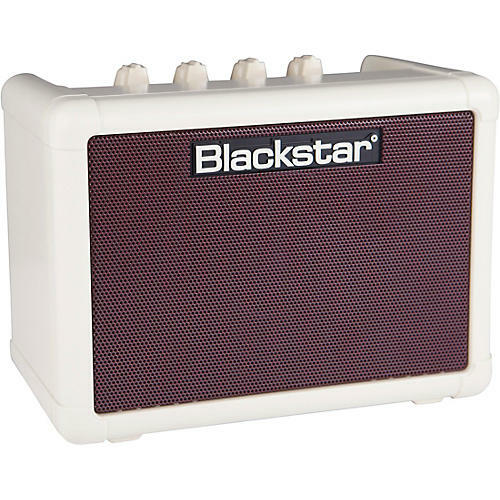 The Blackstar Fly 3W combo is the gold standard for the mini class of amplifiers. Though it's small, it's not a toy. It's an incredible low-wattage practice amp that you can use in your bedroom, put on a desk or throw in your backpack and jam wherever you want, via the battery-powered operation. The FLY 103 is the official extension speaker for the FLY 3 compact mini amp. The FLY 103 comes with its own built-in cable to connect it to the FLY 3, making it a true stereo setup. When connected to the FLY 3, it makes a set of portable speakers to play your music through. Or it can be used as a set of computer speakers.